How fitting that I become reacquainted with this Turkish word while here. Merriam-Webster’s definition is ‘a power that is believed to control what happens in the future’ and therein lies the important question: is fate something that controls us or something that we create? Is destiny a single line from one point to another, or is it more akin to Turkey as an eternal crossing point? When I am asked by friends, family, locals, ‘why are you in Turkey?’, perhaps I should just state ‘kismet’. Of course I have always wanted to visit with so many images, places and things of interest (as evidenced by my wanderlist) and it was one of the top places for me when I starting “planning” my travels. But I must admit that it was not without hesitation to come…for awhile, I wondered if the universe was telling me not to go. There was the bombing at the Ataturk airport the night I was mulling over finally purchasing my ticket..and then the group of boorish Turkish teachers I had to deal with in Kotor. But haven’t I always said that ‘life isn’t what happens as much as it is about how we choose to react?’ and as importantly as reminded by a good friend, we should not live our lives in fear. Unfortunately terrorism and harassment can happen anywhere. And besides I have adopted a mantra as of late and it helped me realize what I should do – be brave, be strong, be confident to live and love the life that you are meant to. 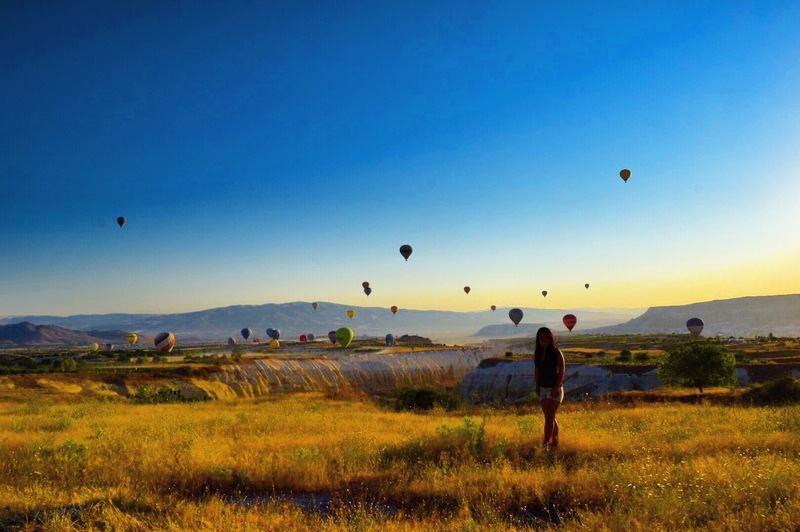 So fate and I conspire and I end up flying from Istanbul to Cappadocia my first day in Turkey. I typically don’t plan much besides transportation into a city and accommodations for my first night so this was quite lucky but it’s not until later when it becomes apparent why. But for now, I take the prearranged shuttle to the hostel and meet A (who was helpful from the moment I booked Hostel Terra Vista such as booking said shuttle). 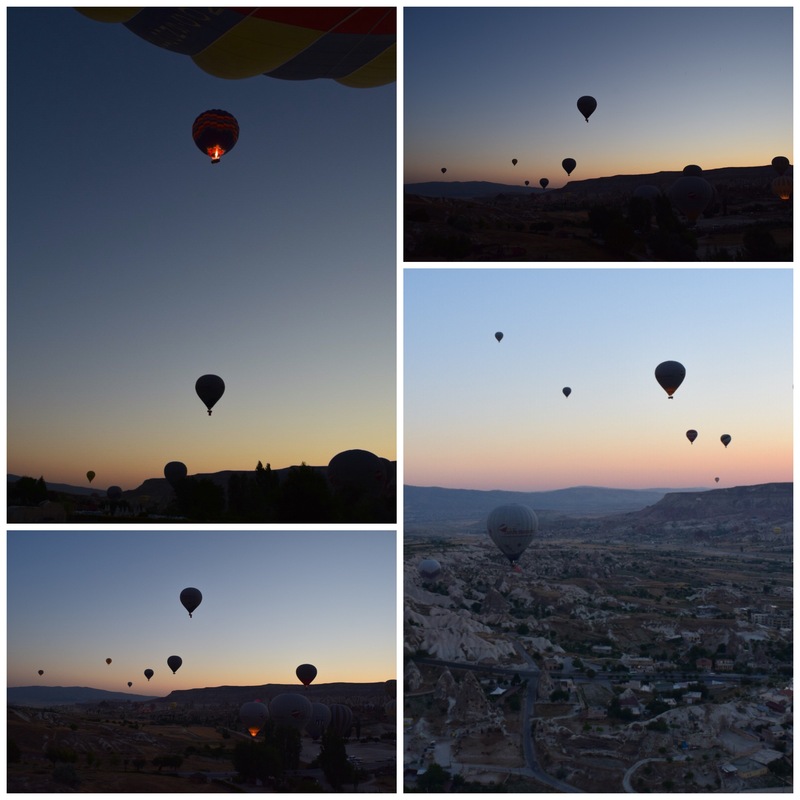 He helps me craft a plan for my stay in Cappadocia including highlighting a route for this afternoon and booking my tours and hot air balloon ride and even advises me on Pamukkale. I am so excited to go out that I don’t check my bag carefully. This could be a result of the general travel weariness I’m experiencing from all these long bus rides plus cumulative lack of sleep catching up to me because somehow I didn’t pack my camera and my charger and then soon my iPhone is dead. It’s pretty hot out but I’m in such amazement at how much there is to see here and that compels me onward…the open air museum, the churches and frescoes, fairy chimneys, pigeon houses! I head back and witness a gorgeous sunset on the roof terrace of the hostel. I am only disappointed that I wasn’t able to any pictures but really it’s a great first day. I’m about to go to bed when I see an NPR news alert on my phone about how the military takes over control in certain parts of Turkey. I think to myself “hmm are they finally rising up against Erdogan?”and am about to fall asleep when I realize – ooooooh, I AM IN Turkey… It’s after midnight and I should go to sleep but instead head downstairs and see A looking worried. He’s going into town and invites me to come along. So I do because I’m now wide awake. It seems as if the whole town is awake and gathered there: listening to the news and discussing, waiting, worrying and the air is thick with uncertainty and fear. A translates as much as he can for me with the whirlwind of conversation flowing around us – I think that it helps him from thinking about things, specifically his family and young daughter and his own fears. He stops and asks why am I not fearful? 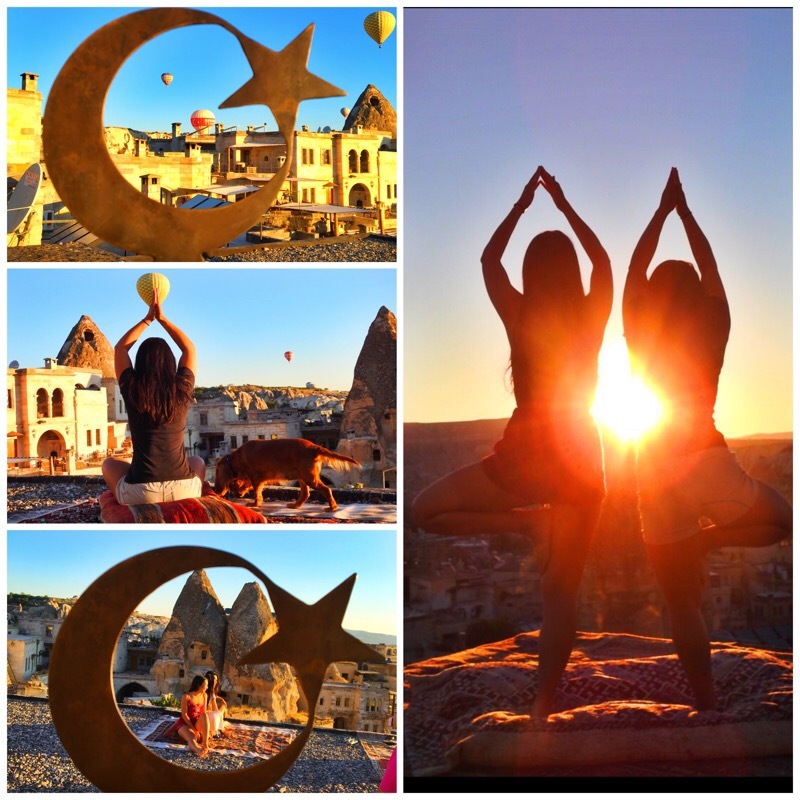 I quietly whisper but I am worried…for you, for the people, for Turkey but for myself, being here in Cappadocia and being American, I am not worried ~ because I have the privilege and luxury to get out if necessary. That is why I have decided not to answer the rush of messages now coming in and because is nearing two and I have to be ready in two hours. So he walks me back and I’m soon in a dreamless light sleep state. I wake up with excitement at first ~ have you ever seen the pictures of this place? One friend calls it beautiful stoneland…it has haunted my travel dreams for a long time. And today I would be able to see it from the sky in a hot air balloon! But then I remember last night’s events and I get ready quickly and go downstairs. There is no one there and no new developments as far as I can find so I wait for my pickup. I’m going on my hot air balloon ride because I reason it may be my last opportunity if the situation worsens. I send messages now letting people know that I am safe and far away from the fighting and chaos in Ankara and Istanbul. The morning is crisp and the sky is cloudless with a gentle wind ~ picture perfect conditions. 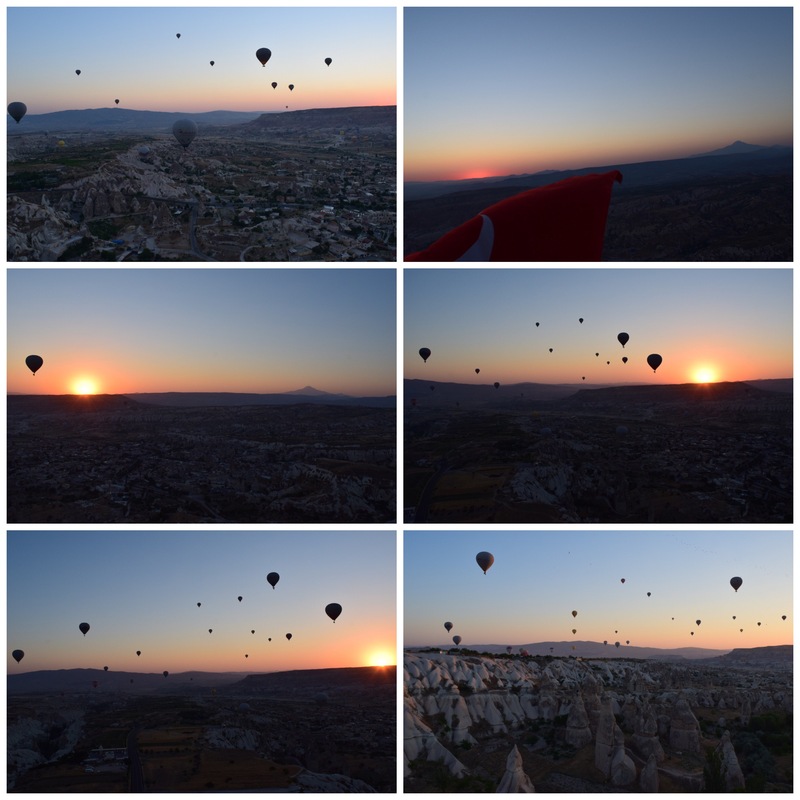 And the hot air balloon ride is so gorgeous, calm and peaceful; so take a moment and allow these pictures to paint the dreamscape for you. We glide over the town and the landscape and even go low into the valley to see the formations quite close and it’s really quite incredible. But even these photos cannot fully do justice to this place, so go and see it for yourself! When I get back, A is up and watching the news and he tells me that order is being restored as it appears that the “coup” is over. I put coup in quotes because I think that it’s a very strong word to use for what transpired. It is quite suspect the speed with which the government was able to arrest such a large number of people in such a wide swath of society so quickly but feigns ignorance that it knew nothing of the plot before it happened. As a student of history, I look at these incidents warily and with grave misgivings. Power can be dangerous especially when it becomes consolidated and we always look back and see so many warning signs that we failed to heed but that is a story for another time… There is so much to see in Goreme and Cappadocia and I end up taking the green tour with a new friend that also happens to be an amazing photographer. Thanks E for some great photos! The bus takes us to our first spot, the Göreme panorama (TL photo). There you can also find this tree (TR) decorated with nazars ~ blue eye shaped amulets said to protect from the evil eye. Next we head to Derinkuyu Underground City. There you go underground ~ seven or eight? floors to a depth of 60 meters ~ 200 ft and through these tunnels and see a winery, church, among many other interesting rooms as shown in the rest of the photos. It’s a very cool experience (pun intended since it can be chilly so far underground)! Then we head to our next destination, Selime Monastery (TR photo) and walk around. I would recommend not wearing worn out flip flops ~ one would think I would have learn my lesson but now I’m testing them in as many countries and unwise spots as possible and luckily I didn’t tumble down. It’s not a large location but it’s set in an idyllic spot (as shown in TR photo) and I find it interesting to see these ancient Christian places (TL) in Turkey especially the frescoes (MR). We had lunch then headed to Ihlara Valley hike (BL). It’s quite hot and I wade through the stream and you can grab a drink and cool off at a tea house along the way (ML). We stop off at a jewelry store and then the last stop on the tour ~ Pigeon Valley (BR) before heading back. And then we meet some locals and I drive a horse and buggy (badly ~ in my defense it was my first time and he unexpectedly handed me the reins as we had to round corners!) and then attend wedding festivities (the actual ceremony and reception was unfortunately happening the next evening!). 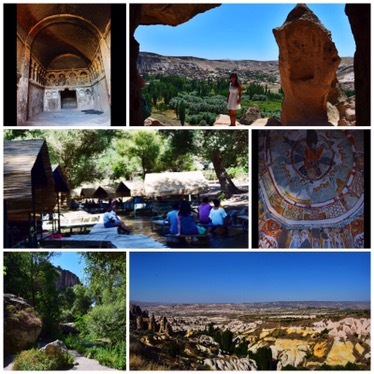 Quite an eventful and jam packed day in Cappadocia. I’m loving Turkey ~ the places, the food, the ice cream, and especially the people. 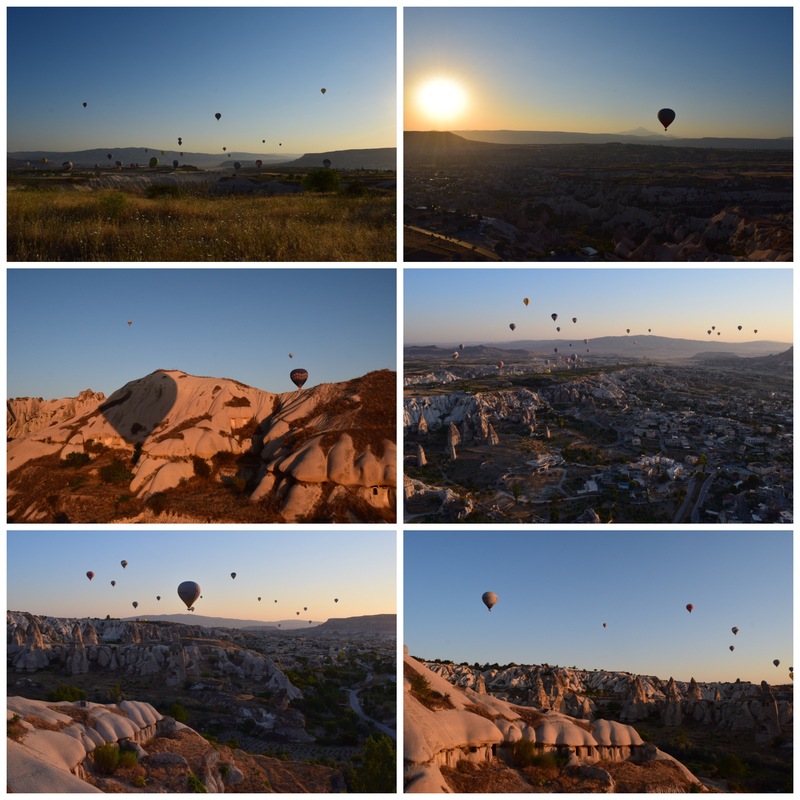 We go to Sultan Cave Suites the next morning to watch the hot air balloons as they have an amazing vantage point/balcony. The owner and official photographer were so welcoming even though we weren’t staying there. They took tons of photos for us and helped capture some incredible shots ~ and it wasn’t as if there weren’t any paying guests there but they made no distinction and were absolutely warm and welcoming. And they have the cutest dog to boot (a glimpse of Izmir in the ML photo).